We are the biggest flagpole manufacturer in Poland. You can find our flagpoles both nationwide and all across Europe. While constantly evolving, our company draws on the latest technologies, which, whichmbined with good work organisation and the professionalism of our team, enables us to offer you a unique quality with fast turnarounds and attractive pricing. Our flagpoles are manufactured from glass fibre and high-grade aluminium. All our flagpoles come with full technical documentation provided by the Building Research Institute (BRI Technical Recommendation: RT ITB-1066/2013). We warrant our flagpoles for ten years. We have our own road fleet and experienced staff. 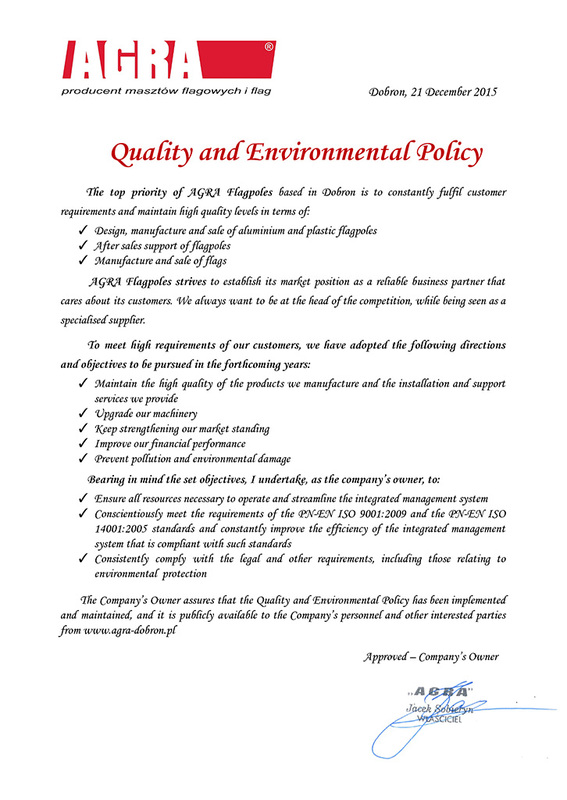 Our company’s longevity is a guarantee of the reliability and integrity of our work. We also offer routine checks, full support, maintenance, cleaning and spare parts to extend the life of your flagpoles while keeping their original pleasing appearance. Our aim is to manufacture and sell high-quality products that meet customer requirements. We ensure the highest diligence at each stage of the works, which involve the design, manufacture and sale of aluminium and plastic flagpoles, the installation, scheduled inspections, maintenance and cleaning of flagpoles and the manufacture and sale of flags. 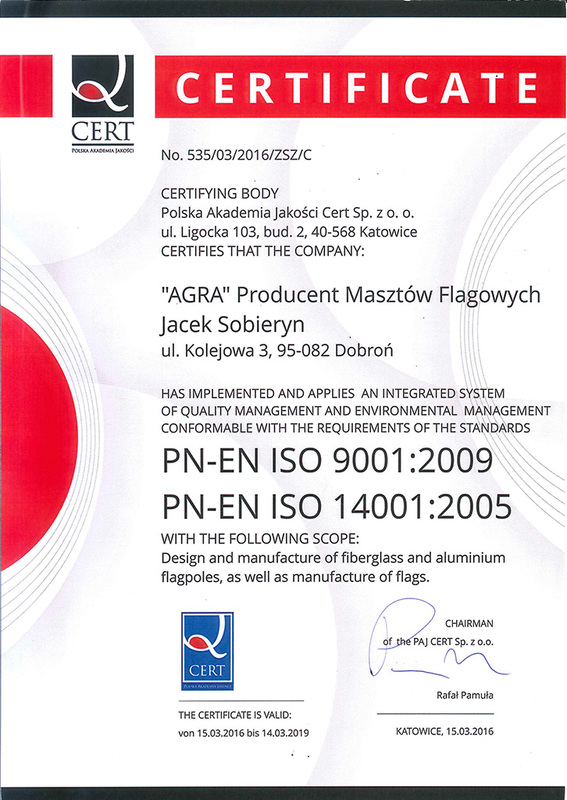 In 2016 we implemented and operate an Integrated Quality and Environmental Management System that is compliant with the PN-EN ISO 9001:2009 and PN-EN ISO 14001:2005 standards to the following extent: ‘Design and Manufacture of Fibre Glass and Plastic Flagpoles and the Manufacture of Flags’ – CERTIFICATE NO. : 535/03/2016/ZSZ/C.